Fire barriers must be made of materials that are permitted by the building type of construction and fire-resistance-rated glazing, when tested in accordance with ASTM E 119 shall comply with this section. They have to be labeled or show some type of identification, provided by an approved agency that has the name of the manufacturer, the test standard and the identifier that includes the fire-resistance rating. Exit enclosures, exit passageways, to include horizontal exits, all must comply with the code book. When outside walls are part of a required fire-rated shaft or exit enclosure they have to be in accordance with the code. 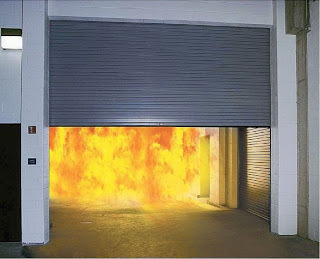 Fire barriers must extend from the top of the floor/ceiling assembly below to the bottom of the floor or roof slab or deck above and be securely attached. Fire barriers must also be continuous through concealed spaces, such as the space above a suspended ceiling. All supporting construction must be protected to allow the required fire rating of the fire barrier supports. Hollow vertical spaces within a fire barrier must be fire blocked at every floor level except that shaft enclosures are allowed to end at a top enclosure when complying with this section. All outside walls that are used as a part of a required fire-rating enclosure or separation have to comply with this section except for outside walls that are in accordance with code exceptions. Openings in a fire barrier will be protected and will be limited to a maximum aggregate width of 25 percent of the length of the wall having a maximum area of any single opening not being more than 156 square feet. This does apply to openings that have adjoining fire sprinklers throughout and the opening assembly has been tested with ASTM E 119, fire doors serving as an exit.